so much is fake news anymore. Fake "journalists" fabricating fake news for the fake audience it targets. Lesson: Do some research before sharing anything on social media. Or, do not forward 'news' or info unless you verify the material. As the old saying goes, "If it sounds to good to be true, it probably is." More to the point, If the "news" sounds too perfect, it's probably perfectly false. Even somethings that are largely true should be reconsidered. For example, the picture purporting to be Colin Kaepernick's house with a meme mocking his victim-claims is true, except for one thing. He sold that house a year or two ago. He probably got several million $$ for it, so the meme if true. But the house is located southeast of San Jose, is somewhat isolated, and is rather identifiable. Why expose the new owners to the risk of being harassed by some who hates Kaepernick enough to try to attack him at home? I saw this floating around yesterday, I remember something about an uncalled for fist bump by Trump that was tsk tsk'd by the "news". Pistures capture an instant in time, with no before-and-after context. 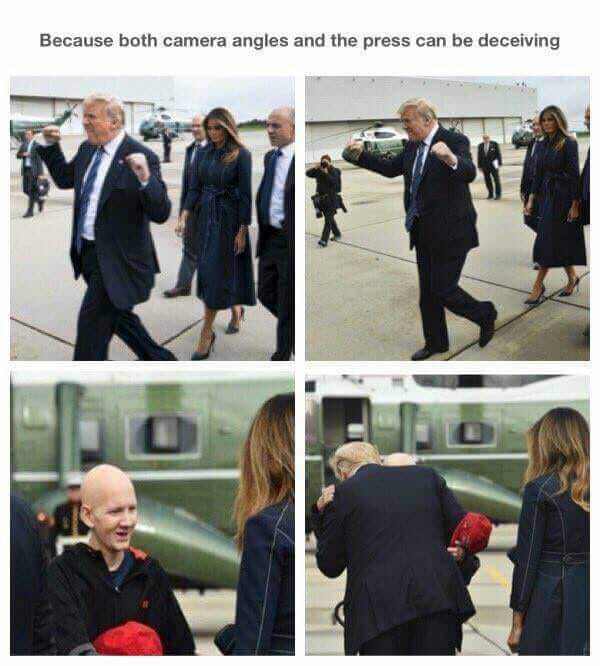 Digital cameras let the user take pictures at many frames per second, letting a dishonest MSM person (or dishonest (wo)man-on-the-street) pick the perfect frame for misrepresenting an event.